Are those wedding bells ringing in the distance? Those who know for sure aren't saying. But that isn't stopping everyone else from speculating. Two celebrity power couples are rumored to be planning trips down the aisle. Sources say singer Janet Jackson will wed boyfriend hip-hop producer Jermaine Dupri this Winter in France. Miss Jackson is a two-time divorcee, but it seems Jermaine has convinced her the third time's the charm. One of the gossip rags (which we are NOT, thankyouverymuch) is reporting that the couple will have a simple but romantic ceremony in Paris with the Eiffel Tower as the backdrop. 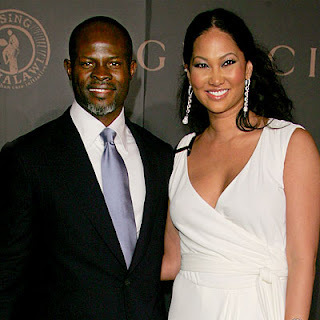 Fashion icon Kimora Lee Simmons and actor Djimon Honsou are said to be "sort of" engaged. That's according to People.com. The two former models have yet to confirm any wedding details, but when asked at a recent event if she and Honsou were engaged, Simmons replied "Kind of." Uh HUH! The couple met in February 2007. So, will they or won't they? We'll have to wait and see! Have you seen the All-Black Vogue Italia? Is Assigned Seating Really Necessary? Delayed Childbearing A Bad Idea? Are You An Adultolescent? Or Married to One? Guess Who's Making Wedding Dresses Now? Do You Have A Marriage-Ready Checklist?